It can be used as an algebra 1 course for upper middle school and high school. Helps students learn essential skills for high school standardized testing and college entrance exams such as the SAT. Understanding Algebra 1 is reproducible for single-classroom use or single-family use. The author, Terri Husted, writes in an easy-to-understand style. We like the well-spaced formatting—just the right amount of teaching on each page. Colorful diagrams and graphics will help your student to understand the concept. 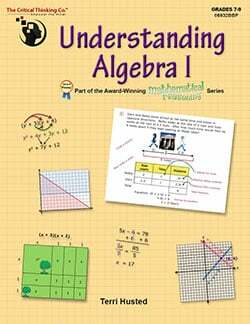 From the Critical Thinking Company, Understanding Algebra develops critical thinking skills in algebra. 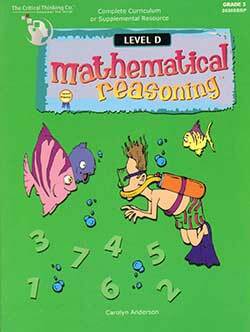 Teaches essential concepts and skills necessary to understand fully algebra. Students will learn the basics of geometric proofs and coordinate geometry. Provides students with real strategies to succeed in solving word problems. Explains algebraic concepts simply and effectively. Introduces new concepts in a step-by-step fashion to lay a good foundation. Uses critical thinking questions to improve understanding and master core concepts and skills. Has examples from the history of math. Bridges the gap between computation and mathematical reasoning. Answers are in the back of the book. It can be used as a course in grades 7 to 9. It follows the National Math Standards.